My name is Samantha and I am a 24 year old Australian who recently ventured to Japan, notonly to improve my language skills but also to experience the Japanese culture, history, cuisine and traditions.From soaking in onsen on a cold winter’s day to eating more takoyaki from the streets of Dotonbori than I would like to admit,nothing was as rewarding as my home-stay with the delightful Yuko Kariyazaki and her family. Yukois the founder of H.U.G. (Hug, Unite, Grow), a volunteer international exchange association whose prime focus is to promote cultural exchange. I was fortunate enough to be part of these efforts. To Yuko, I provided my time; assisting her in English classes and translating for local business owners. In return, I got to experience authentic Japanese culture, form friendships with locals and was shown the techniques of calligraphy, kimono and koto…just to name a few.Home-stay with Yuko was such a unique experience. I got to live in Japan the ways the locals do. I would recommend this to anyone who is passionate about the Japanese culture and wants to be something more than just a tourist. Eight students from our English class went to Taiwan for 3 nights and 4 days in the middle of October. The time difference is only 1 hour between Japan and Taiwan. This year, it was the 100th foundation anniversary, so the main street was decorated with many beautiful flags. The people in Taiwan were polite to us. I thinkthe Japanese could learn from their manners. First of all, we were surprised at the Taiwanese subway system. Coins covered in plastic were used instead of tickets. They also got recycled. 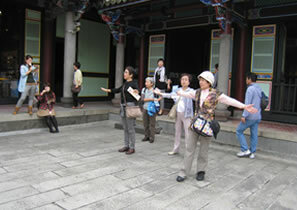 The Taiwanese women were friendly and kind and didn't wear much make up. We visited many places for sightseeing. Tansui and Kyufun impressed us the most. 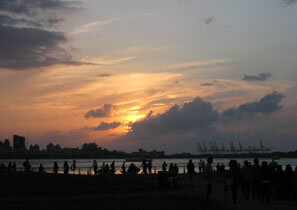 Tansui is called Venice in Taiwan because of its brilliant sunset. 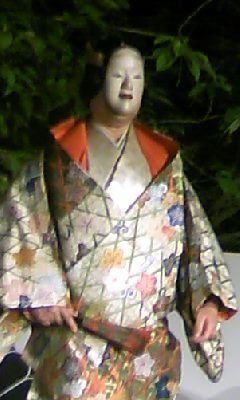 Kyufun's atmosphere was nostalgic as it reminded us of old Japanese culture. The treasures from Shikin Castle are now in Kokyu Museum. 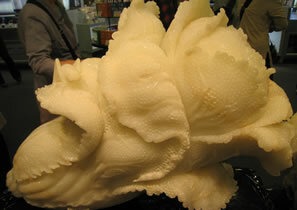 The most famous treasures are the Chinese cabbage made from jade and the pork meat made from agate. There are many people who can speak Japanese in Taiwan. They were very friendly. 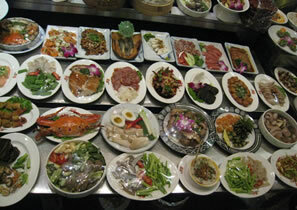 We went to a famous restaurant and ate many kinds of Taiwanese dishes. They were delicious and inexpensive. We were very satisfied. This trip was the best and most inexpensive one I've ever done. We were very happy in Taiwan. Place the butter, granulated sugar, bananas, eggs and vanilla essence in a bowl. Mix with an electric beater for 2 minutes. Add the plain yoghurt and mix for 1 minute. Sift the flour and baking powder into the bowl. Mix with a wooden spoon until just combined. Pour into the cake pan. 7. Bake in the oven for 1 hour or until a skewer inserted into the middle comes out clean. 8. Leave the cake in the pan to cool for 10 minutes and then transfer it to a wire rack. Place the cream cheese and butter in a bowl. Mix with an electric beater until well combined. Add the sugar powder and mix until well combined. Add the plain yoghurt and beat until the mixture is light and creamy. When autumn comes, many art exhibitions are held in Kyoto. I'm looking forward to going to a small one. 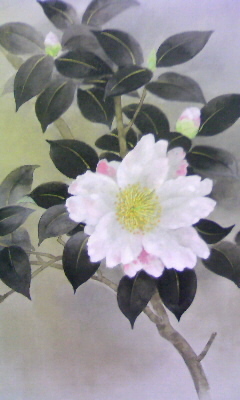 It is called“Hyo-Ten”(表展 The japanese art-frame exhibition). There are many kinds of art-frame displayed from traditional to modern. Of course there are not only frames, but pictures which go into frames. If you are there on weekends, you can enjoy an artistic day. But if you are there on weekdays, maybe you will feel a different atmosphere. Because the exhibition combines the art-frame competition. The entries visit there on weekdays for watching their result. They are judged how good the frames match the pictures. I saw one young man staring at one picture. Was it his rival's work? Also, I overheared someone's murmuring. I could'nt understand what color was so adventurous, but I was not bored with looking at them. One fine autumn Sunday my friends and I had a happy time. Because Mrs.Kariyazaki invited us to the tea ceremony of HUG. 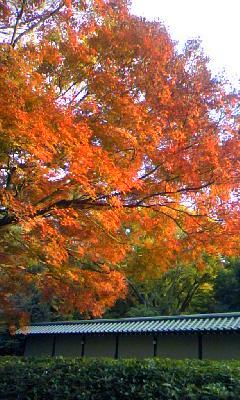 It was held in the tea house“拾翠亭"in the imperial palace park. This house belonged to an aristocrat a long time ago. It is a pretty house. We arrived there at 12. There were a lot of people. We waited for a short time in the waiting space.There were a couple of foreigners. When we were talking about the tea ceremony, they asked us how to do Ojigi. My friend told them. Actually I've never thought about it befor, her advice also helped me. Soon our time came. I didn't need to worry. 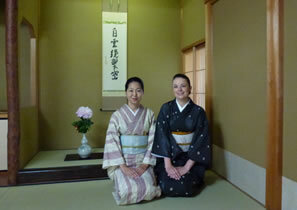 Mrs.Kariyazaki explained about the tea ceremony. I didn't know November was the beginning of the tea ceremony year. We had fresh green tea with a nice cake. We had an elegant japanese day-off. But my friend says "Half of them have turned professional now" There are many convenience goods and handmade meals. Most things are high quality. The shop's owners talk about the things they made happily if I buy or not. Especialy some meals are popular with homemakers. I have to go to get it by the afternoon before they are sold out. From the afternoon many tourists visit there. The market is crowded with many people. Kyoto has many free markets here and there. 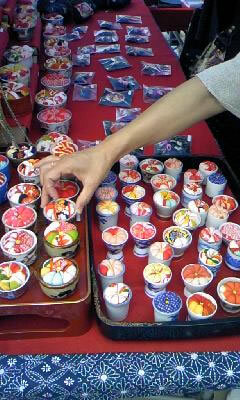 Some of the famous markets are Kobo-san in Toji temple and Tenjin-san in Kitano-tenmangu shrine. The popular antique markets are held there. lately a new market is getting popular with local people. 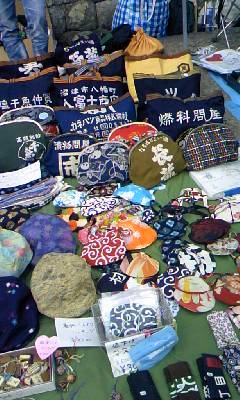 It is a handmade market in Chion-ji temple. It began about 10 years ago. It was started by some handmade clubs that shared the same interests. Therefore professional tradesmen are not allowed to display their goods at the shops there. Last Saturday my husband and I went to a small town in the north of SHIGA.The town's name is Halie in Takashima-cho（高島町針江地区）. The trip was planned by a group of architects in Kyoto. 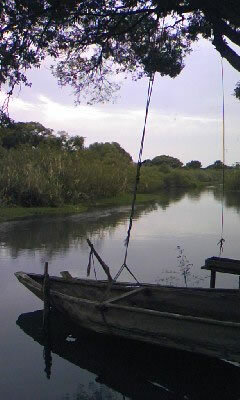 The town is well-known as an ecological system and for its beautiful scenery. Almost all the houses have a nature fountain inside. They use the water in their dayly lives. They never use synthetic detergents to keep their hometown beautiful. 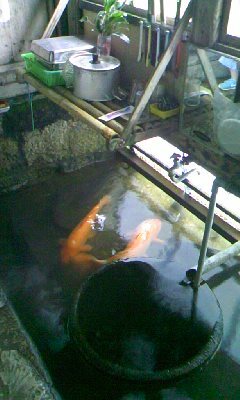 Every house keeps carp in a pool. It connects to a river and lake-Biwa. One lady explained this to us. "These carp eats the scraps of meals and cleans the water. Especially they like pans used for making curry. I soaked a pan in the water, carp polish it up." What an ecological and convenient kitchen system she has! I didn't know the carp's favorite food is curry! Last tuesday,after a lesson,I hurried to the SHIRAMINE shrine.Because this day was "the NO play day" in this shrine. I'm not an eager fan of NO,but this chicket is cheeper than other plays thanks of Kamigyo-ku aiding. This fee was\1500 and the event was played since afternoon till night.How reasonable this fee was! I saw the 観世流 NO play 「殺生石」.I could'nt this story well,but I enjoyed this fantastic atmosphere.